Studies show that each of us has a happiness set-point -- a fixed range of happiness we tend to return to throughout our life -- that's approximately 50 percent genetic and 50 percent learned. In the same way you'd crank up the thermostat to get comfortable on a chilly day, you can actually reprogram your happiness set-point to a higher level of peace and well-being. This life-changing program shows you how! 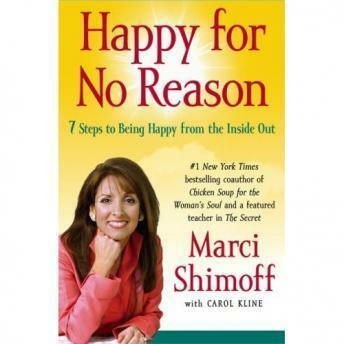 In Happy for No Reason, transformational expert and bestselling author Marci Shimoff reveals a remarkable program, incorporating the latest findings in positive psychology, moving real-life stories and powerful tools and techniques that will raise your happiness set-point and enable you to experience more unconditional happiness in your life -- starting today. Excellent book. I love the personal stories and tips and suggestions by the author. It has deep, meaningful and valuable information. I thought it was read a little too fast, but other than that I highly recommend it to anyone who wants to be happy or take their happiness to the next level! You'll find a lot of inspiring stories and practical tips. Really helpful.